“Showing the film, I feel, will help other women to believe that some people really can make a difference – and it will help to encourage others to try” (Abigail E. Disney). This story is about one film and the lives of women in Afghanistan fighting for change , it’s about one woman and thousands of women who inspired Abigail to create this film; it’s about war and peace through the lens of women. 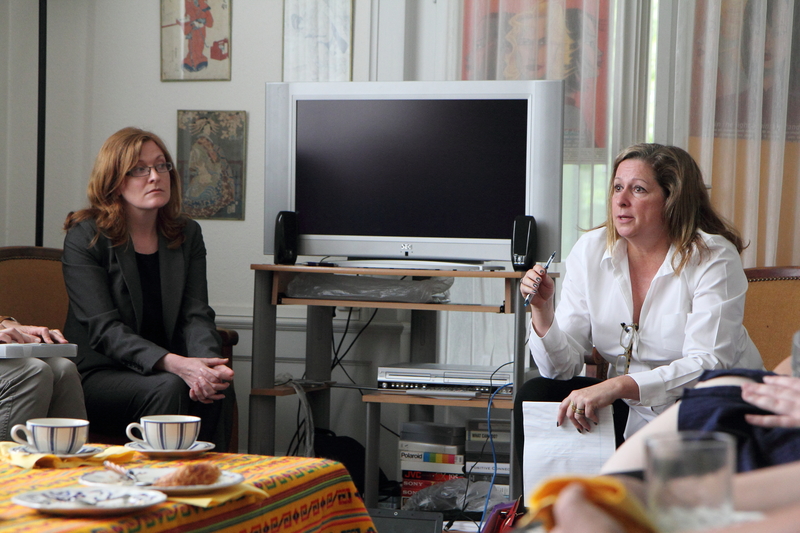 First of all let me introduce you to Abigail Disney – a famous filmmaker and very good YWCA friend. Her longtime passion for women’s issues and peacebuilding culminated in her first film, the acclaimed ‘Pray the Devil Back to Hell’, about the Liberian women and their efforts to bring peace to their broken nation after decades of destructive civil war. Abigail is currently executive producer of the groundbreaking film-series ‘Women, War & Peace’. The trailer screening ‘Women, War & Peace’ was shown in World YWCA office during a breakfast meeting last week with Abigail and the special interactive dialogue with 25 NGOs. This side event was hosted and co-sponsored by World YWCA on the occasion of the 20th session of the UN Human Rights Council. On the same day Abigail’s the third film in the ‘Women, War & Peace’ film series – ‘Peace Unveiled’ was shown. This event was hosted by Permanent Mission of Canada and also co-sponsored by World YWCA and Interpeace. The guests of these events had the opportunity to discuss the role of the woman in peace process, to speak with Abigail and express their own thoughts and opinions concerned to peace and war issues. Discussion was moderated by Scott Weber, Interpeace Director-General, and Michelle Higelin,World YWCA Deputy General Secretary . Abigail highlighted that war is always shown in the media from the perspective of men or soldiers. But what is behind of them? In my opinion Abigail is one of the first filmmakers to show women’s experiences during conflict or war. Women and children they are the ones who are most affected by war. They are the ones who lose their families because of war and suffer a lot. I believe in society it is women who have been given the job of carrying on with the activities of life and death. ‘Peace Unveiled’ follows three woman in Afghanistan who are risking their lives to make sure that women have a seat at the negotiating table of the peace talks between the government and the Taliban, thus having a voice in determining Afghanistan’s future. Somebody may say that the film is too soft and does not address the core issues but tears were in the eyes of those who watched it. Abigail has a great mission to unveil the war reality, to show the impact of war on women and children and support peacebuilding through non-violent means. Abigail says that one of the things that make this film so powerful is that it can create a wellspring of energy for what she knows to be a global movement of women who are working for transparency in government, for peace and for better education. She believes that this film will help to show women that when they can speak out, it can really make a difference. I think it’s truly empowering.